The international launch of the BBC's iPlayer service, one of if not the finest example of an IPTV service, has been eagerly awaited now and has been expected for a couple of years, especially with the number of British ex-pats living around the world. Now rumour has it that the rollout will begin with a subscription-service for the iPad according to Engadget and Broadcast Magazine. This subscription model will allow the BBC to accommodate licence-fee payers in the UK who each pay around £130 a year for this public-service broadcaster. This is excellent news for worldwide fans of shows like Top Gear, Doctor Who, EastEnders and erm... Cash in the Attic (maybe not that last one). There's no word yet on when the service will be available but the Director General of the BBC, Mark Thomson, has previously said it would almost certainly be sometime in 2011. BBC Worldwide is sadly mistaken if they think making the Global iPlayer an iPad-only app is a money-making business decision. There are hundreds of thousands of US lovers of UK television who would gladly pay $15-20 per month for legal access to a Global iPlayer (assuming it had much of the same content as the UK iPlayer), but will NOT shell out $500 extra just to watch the iPlayer on an iPad. 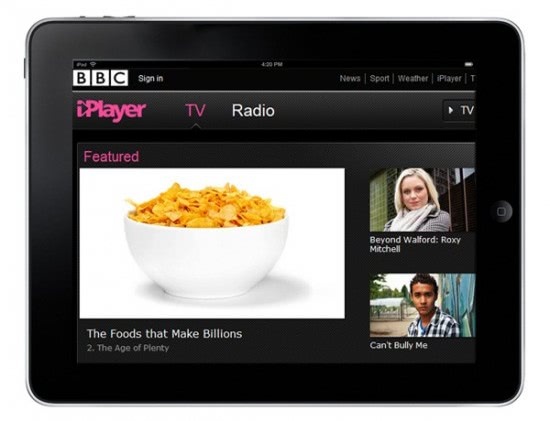 Why would I spend $500 extra to watch the iPlayer on a 9″ screen? I’ll just continue downloading shows online soon after UK broadcast if the Global iPlayer is iPad only. If you want my money BBC, then give everyone access to the Global iPlayer, not just iPad owners.